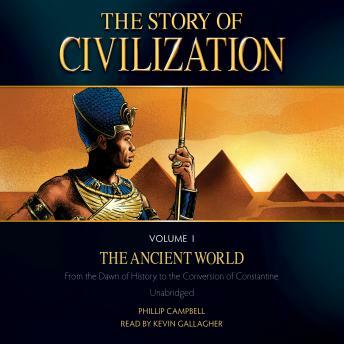 Talented voice actor and audiobook producer Kevin Gallagher returns to bring children the history of the world in this riveting reading of The Story of Civilization: The Ancient World. This follows his immensely popular reading of TAN Book's The Story of the Bible. Your children will be transported back in time through the sound effects, music and voice acting that complements the reading of the text. Whether looking for entertainment on a long road trip, enhancing the experience with the text, or catering to the needs of a child with a reading disabilitythis audio dramatization will open up a new world of adventure for kids of all ages. That young people in the Minoan culture participated in bull leaping games? That King Xerxes of Persia once ordered his soldiers to whip the waves when the ocean became rocky beneath their boats? That the Greek inventor, Archimedes, built a giant heat ray to protect his hometown, catching enemy ships on fire through the use of sunbeams? That the powerful Carthaginian general, Hannibal, used elephants to march his army over the Alps on his way to attack Rome? That Julius Caesar of Rome fell in love with the famous Cleopatra of Egypt? Embark on the journey now to learn of all these wonders and more! The Story of Civilization has seven products and uses the "schoolhouse model" so that kids of all ages can engage with the content. How old the child is determines which products he or she will use. The Dramatized Audiobook can be used by children from 1st Grade all the way to 8th. Younger children can listen without the book and let their imaginations run wild with all the stories, while older children can use it as a way to enhance their reading experience.